The new government have taken a strong and positive stance on the role of public transport in our cities. Over the last decade or so I think that the public and media have come a long way in how they view, report and opine on PT. However, with more investment on the horizon, I suspect we’re likely to see an increase in articles and opinions questioning its value, or more specifically it’s costs. An example of what I think we can likely expect came a few weeks ago from interest.co.nz by David Chaston who calls PT “a public drain”. There were a couple of phrases that immediately sprung to mind after reading it, such as that he “knows the price of everything and the value of nothing”, that a “a little bit of knowledge is a dangerous thing” and that “context is everything”. To be a fair, I think part of the fault with this lies in the data that Auckland Transport provided and probably the lack of explanation surrounding it. So, let’s step through some of the issues with the piece. The core of the issues with the piece stem from these tables with data provided by AT. The thing I noticed in particular is that some of the numbers don’t match up with other sources, such as this excellent tool from the NZTA. As an example, the tool tells us that revenue from bus fares during the last fiscal year was $116.6 million (excluding SuperGold subsidies which account for another $9.4m). That’s almost 1/3rd higher than the numbers below. I suspect the key reason for this difference is that AT provided Chaston with their costs and revenues, not those for the entire PT system. However, at the same time the ridership numbers are for the entire system. In addition to the garbage data is the issue of the system being in the middle of a fundamental transition. This is referenced in the text below the tables but is incomplete. It’s not just the revenues that are changing but also the costs as we shift from net to gross contracts. This something I talked about the about in more detail the other day. However, this transition is ongoing and won’t be complete until the New Network is rolled out. That means there’s another year or so where the data is not going to line up all that well, especially as many of the city’s most successful routes are part of the isthmus and North Shore networks. One of the advantages of the NZTA data tool mentioned earlier is that it appears to give whole of system information, not just AT info. In other words, it appears to include figures from both AT and private operators. The piece starts by looking at the average fares and subsidies of each mode, proclaiming trains to be the most subsidised. But to get riders out of their cars heavy subsidies need to be offered. Auckland bus riders paid an average of $1.40 per trip, but the rate-payer and taxpayer subsidised this by another $2.57. Each ride they took actually cost $3.97 on average, meaning there was a 65% subsidy. But that encouraged ridership. 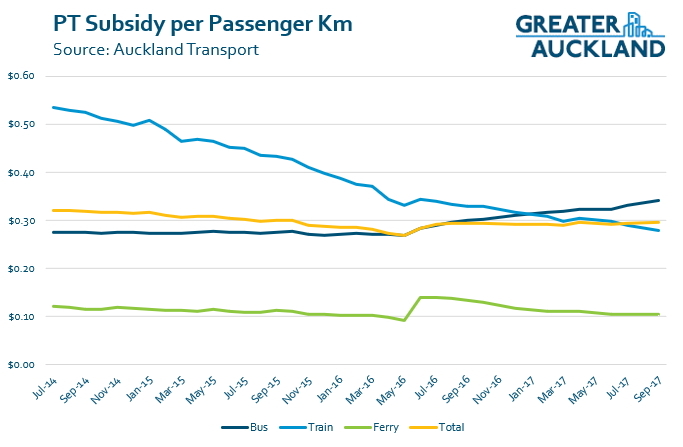 It grew on Auckland buses by +4.1% from the 2015/6 year to the 2016/7 year. The situation is more dramatic for train ridership. That grew by almost +17% but the subsidies are huge to get that impact. Each Auckland train rider paid an average fare of $2.58 per ride but “someone else” paid another $4.53 per ride. Each ride actually cost $7.11, a 64% subsidy. For ferries, the subsidising is not as heavy. Rides cost user on average $1.36 to be zipped across the harbour. But those rides cost the system $3.07 meaning each one is subsidised $1.69. There are a couple of issues with this. First, the garbage data mentioned earlier means the figures here are incorrect. 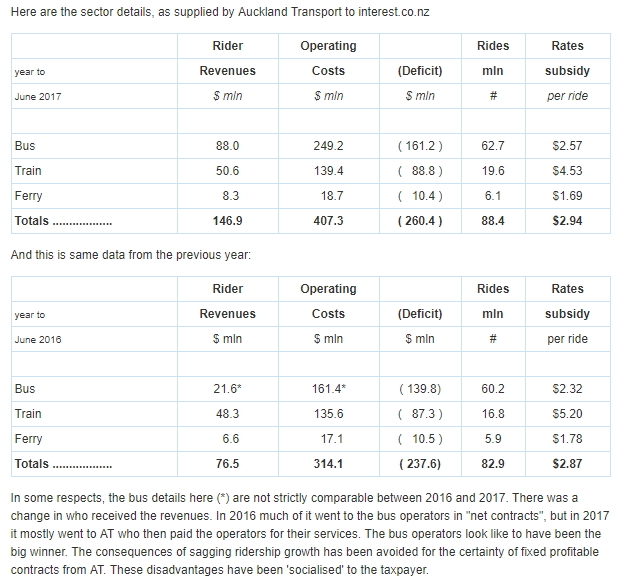 Based on that NZTA data the actual cost per ride is just over $2 for buses, around $2.50 for trains (like mentioned) and nearly $5.70 for ferries. The trains are the most accurate because they’ve worked on a gross contract basis for a long time. The second issue is the subsidy per ride, again putting aside the incorrect figures. The piece of puzzle that’s missing from this is distance. Yes train trips are subsidised more per trip, but that’s only because the trips themselves are longer. The NZTA data also provides the combined length of travel by passengers. It shows that average journey for each mode is of the following length . Combine that with the subsidies paid and the subsidy per passenger km becomes available. This is a much more useful metric and is one being monitored monthly by AT. As you can see, trains are now subsidised less per km travelled than buses are. This is a result of electrification improving the efficiency of trains while ridership has doubled. It never ceases to amaze me that apparently intelligent commentators can so easily mix up the difference between financial costs and economic impacts. There seems no way out of this endless subsidising. 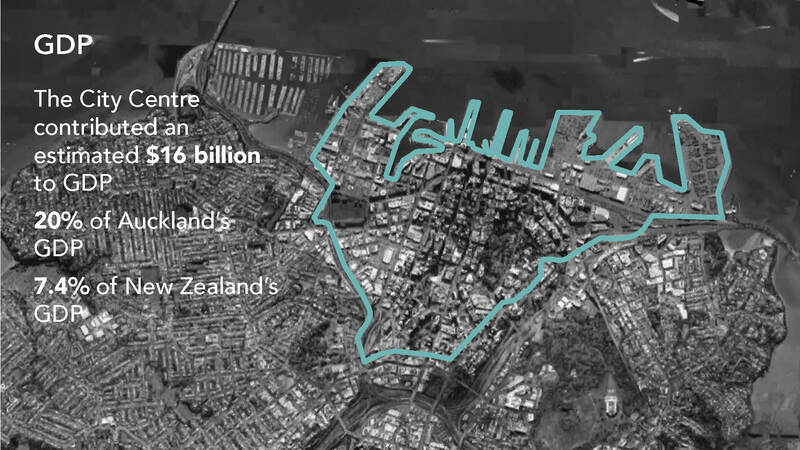 It will overwhelm Auckland who has borrowed to build a system that can never pay for itself. The ability to tax is the only thing that keeps Auckalnd Council with an investment grade credit rating. No private enterprise could ever get away with such a bankrupt commercial idea. We don’t build public transport to “pay for itself” because it’s not a business. We build it and subsidise it’s use because it provides both economic and social benefits to the city and the country. For example, every morning, around 40,000 people and growing enter the city centre on a bus, train or ferry. That’s now more people than arrive by car. The cost to build enough road space to handle that many extra vehicles would be astronomical. Not to mention the cost of all the extra carparks that would be needed. Alternatively, we could not fund PT and have a less successful and interesting city centre but with an estimated annual GDP of $16 billion, that doesn’t like a great strategy. I also don’t recall anyone ever questioning whether Waterview, or any other road project, would pay for themselves. And let’s not forget that 50% of local roads are paid for by rates, not by users through fuel taxes. There is a lot more I could say about the piece but in the interests of my time and sanity I’ll finish here. I do agree that we need to ensure we’re getting good value for money from our PT spend. First, let’s start by ensuring we’re having an accurate conversation, both about what PT costs and what it provides for the city. I have heard London Underground runs at a loss. I don’t think it would be a good idea to shut it down to save money. Would be quite a few negative impacts. It is actually not subsidised at all, its cost neutral. TFL runs at a loss. Obviously the underground can achieve that because of the extremely high patronage and lack of viable alternatives. My understanding is that there are no PT operations that make a profit. i.e. a return on capital. So they are all subsidized. Places like Hong Kong, Singapore & London do/may make a return to cover opex and maintenance costs. We have PT as it provides a social service to those that do not have the means otherwise to do so. At a very minimum a full coverage network should be provided with maximum 30 min headways. I seldom see this happening. They dont even need to be fixed routes. Low demand areas can be provided for by on-demand services linking to the fixed route system. Then and only then should we be providing higher frequency services on routes that can provide the typically accepted 50% farebox recovery or better. The metro systems of Hong Kong and Singapore do turn an operating profit on metro operations, and provide a return on capital overall as part of broader system and retail development, i.e. they make money on customers to their business in developments that are only sustainable with abundant metro access. In otherwords they have vertically intergrated transport, development and land value uplift capture. My esteem of Interest.co.nz has just taken a dive, especially as David appears to be the site’s publisher, not just a random contributor. Poor show David, looks like you’re just after the clickbait market, rather than offering decent financial info. Thanks for your article Matt. I guess I used that word as well without thinking, so thanks for the correction…but my point still applies – a high profile site offering poorly qualified analysis. Chaston should do public hospitals and schools next. All that cost, such a huge expense to attract people away from private clinics and boarding schools. Seriously though, it is worrying they can’t even get the basic data right. What about children? They’re a huge drain on resources, and they don’t pay for themselves. They typically require 24 hour care, at least 2 stay-at-home workers, and frequent applications of medical products, technical clothing (much of which is then discarded, daily, with little thought), specially pureed food that is highly priced and unpalatable to anyone else, they will consume resources at educational facilities at a speedy pace, they require specialised transport regimes, even their own specialised transport vehicles, often with an excess of wheels – and yet they pay no tax, they don’t pay into the super fund, they will eventually leave the country and often not return. Put simply, children run at loss, and they expect the state to cater for them. Let the free market rule David ! Note: there may (or may not) have been some elements of sarcasm in this discussion above. These critics of public transport and the subsidies required to run them do not consider the benefits in more efficient ways of moving people around. The externalities of car congestion, car pollution and parking are massive. When you say 50% of local roads are paid for by rates what you really mean is that 50% of the cost of arterial roads that are not state highways are paid for by rates. Local roads, those short ones that provide access to houses and industrial sites are paid for 100% by the person doing the subdivision. But then after all the houses have been built in said subdivision, and the trucks from earthworks and delivering building materials for the houses have torn up the roads – the re-surfacing is paid for by the rate payer. And the cars don’t stay on the roads in that subdivision. They turn the other suburbs into traffic sewers. I’d love to have road markings re-painted annually in my area. My part of town must be missing out. For most Councils the money spent on roading is their biggest expense. Roads are funded by fuel taxes, road user charges, rates, registrations, developers (home buyers) etc. Roads therefore are a subsidised asset. It would be helpful for someone at Greater Auckland to do the figures on this. Come on Miffy you’re economic nous is above that. Need I remind you we spend more on road *renewals* alone each year than we do on the entire public transport budget? And your point is? Even if the number of people using the bus doubled we would still need to maintain roads. They need to be resealed to keep the water out of the base and they need to be rebuilt as heavy axles bust up the base. But the biggest cost is the first one, providing the land and building the road to start with. That isn’t 50% funded. New private subdivision you are correct, 100% of cost is paid by developer of building the road within the development site boundaries. Of course developer contributions don’t cover the impact to the local roading network, maintenance of road once handed over to council, nor cost of arterial routes and associated roading infrastructure to these developments. Serious question Matt – Have you attempted to contact David with your concerns? It seems as if he’s trying to be reasonable, but is making silly comments because of a combination of poor data and lack of background on how PT operates (make a profit – Man, that’s get me frustrated). Considering the more broadly focused readership they have, wouldn’t it be good to have a chat with him? It’s a dog whistle piece meant to inspire the rabid libertarians into commenting and boosting his website. The sentence is this ‘No private enterprise could ever get away with such a bankrupt commercial idea.’ If he had half a brain he’d realise that council aren’t providing PT as a commercial concern but as something for the public good like all the other public services provided by both national and local government. Just because he doesn’t like paying subsidies doesn’t mean they don’t provide him and others with tangible benefits. I don’t have children, yet I still think a public education system is a damn good idea. He’s just a troll and should be called out as one. Thanks Matt. I’m too busy to rip into this and would probably get depressed. I hope others do though, as this is the ignorant bias we’re up against so often. Even NZTA’s analysis puts a large figure to the huge subsidy given to car drivers, and that analysis was not comprehensive: it didn’t include the proper costs of climate change and it didn’t include the health costs associated with inactivity due to car dependency, (just two things I checked in a quick perusal). NZTA also don’t acknowledge that road building creates more traffic, and therefore each dollar spent on new roads is putting us into carbon debt further. Whereas PT spending gives more people more options to make responsible choices. Grump! As a country we spend more on traffic policing than we do on public transport… and I wouldn’t know where to start with how much the healthcare and rehabilitation system spends each year on traffic related injury. Ok so there we go, what is that, five times the national public transport subsidy? Car crash social club sounds like a pretty bleak evening out. 🙂 Not a club I’d be crashing. More seriously, the cost assumed per road fatality seems high but it is still an underestimate. The economic cost from the road fatalities we’ve had in my family have been many times the figure they use, when looked at over the multiple generations affected. Matt I meant to say above that this is one of the best posts I have read anywhere in ages. People seem to naturally make this mistake in lots of fields where they use cost as a measure instead of value. At a broader scale people do this with taxes in general focus on a tax cut rather than on how much worse society will be without the services it could have funded. Benefits of PT have always been undervalued particularly in congested corridors where the opportunity cost isn’t just some book value of travel time savings from the EEM but is the value of all the additional delay to everyone else if the marginal passenger were to try and drive. This is why we subsidise. It is the most appropriate way to deal with a positive externality. The flip side is we should also toll a cordon of roads at peak times to create a penalty to deal with negative externalities. Taxes are only ever described as either being ‘hiked’ or ‘slashed’, never simply raised or lowered. This is slanted and over emotional. Regulations should be really described as Protections (whether wise ones or not, that is their intention, to protect something or someone). And Subsidies are really Transfers, financial transfers to intended to unlock economic and social value (again, whether good or effective or not). We currently employ language that encourages the kind of confusions that the author of the interest piece has fallen into. The understanding of these financial and economic tools would be greatly improved with more accurate linguistic tools. I must admit not one of David’s better pieces and I think he falls for the “silo” thinking when it comes to transport. We want to create an entire network which incorporates all forms of transport into our thinking. However, the piece did raise an important issue which is funding. How do we fund our network? It should be noted that no matter what it is taxpayers that pay – whether through petrol tax, rates, or general tax. This means we need to re-allocate funding rather than generating new revenue. I don’t understand what you mean. If a particular demographic isn’t being catered to – say a 12-year-old without attached taxi driver, in a car dependent suburb: unable to drive, unempowered to move, lacking access to the city… This situation could arise in a city where there is little funding of any sort happening. It could arise in a city where there is loads of funding happening, just in the wrong mode for that demographic. What is the logic that says the funding doesn’t need to be increased, just reallocated? I’m certainly after re-allocation, but I’m also aware that we’re in a fossil carbon delusion. So it seems logical to me that the overall cost needs to go up. 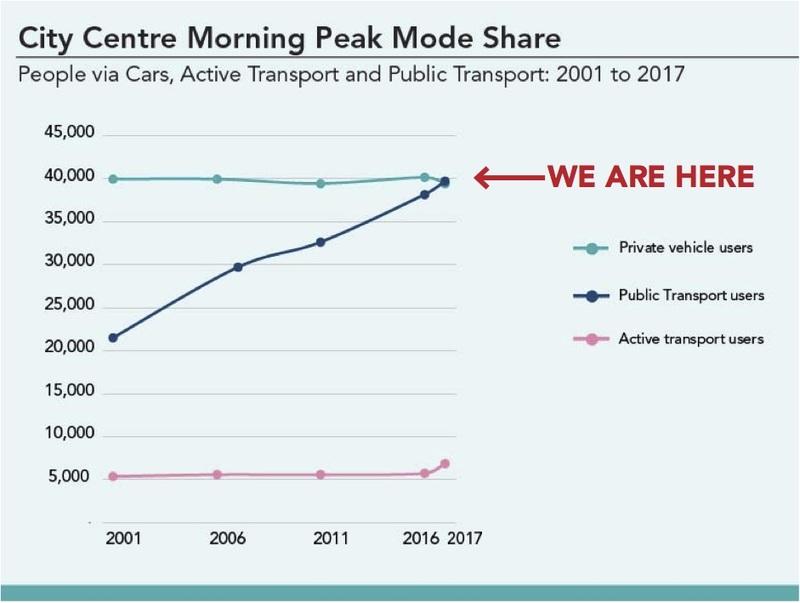 My point is that we spend billions a year on transport right now – mostly on supporting motor vehicles. I think we can achieve a lot better outcomes by spending less on roads for private use and more on PT. I am not convinced that we need additional funding, which will come from the taxpayer, when we are not spending the current funding wisely. Totally agree. 🙂 I suppose I made my comment because the spending on PT and active modes is required whether or not it is politically possible to reduce spending on roads. But yes, in NZ, the existing pool of funds is big enough, it’s just unwisely spent. I am sure Heidi that it is politically possible to spend less on roads. The secret is to pitch the right arguments and this must start by telling people that they can continue to drive, but at the same time to give them many reasons not to drive. Vienna (often voted the world’s most liveable city) has achieved a modal share where only 28% of trips are by car). +1 Adrian. We spend many millions on purchasing cars, fuel and parts for those cars, land to store them on, and insurance to maintain them. There’s a terrible cost to be paid for accidents and fatalities, air and noise pollution and long term damage to the environment. On any measure, there can no more expensive way to move people around our city, and that’s before counting the time wasted in the vehicle traffic that we have encouraged. All of these costs have been inflated by the ongoing failure to invest in Auckland’s public transport. I had hoped that this would change with the new government, but for most of Auckland it absolutely hasn’t. Worse, it seems that vehicle-related costs fall disproportionately on those living further from the CBD. They have less access to public transport and are charged higher fares to use it, which might be the reverse of what is needed to reduce overall vehicle usage. I think we need big changes in the way we think about public transport. Articles that only list superficial cash flows in public transport show how far we are from understanding the many costs of transport and the unfairness that exists in where those costs are borne. With a little ambition, there are opportunities to unlock nationally significant cost savings and much-needed social benefits in my view. The most important point here is that traffic is halved by public transport use. Given the billions lost in travel time, the economies are already obvious. As you correctly point out, an extra forty thousand private vehicles would bring the inner city to a stand still. And as always, people forget that their cars drive on roads, use traffic lights, cause accidents, pollute the atmosphere and encourage antisocial behaviour. All things that cost incalculable amounts of money. Auckland has an improving public transport network, that for many functions very well, after decades of neglect, and we don’t need neo liberal accountants to pick apart the finances. The fact is public transport is healthier, more social, safer and more relaxing. The intrinsic economies in these things are never calculated. A petrol tax, sugar tax and bottled water tax (followed by a cowpat tax when certain people look up “communist” in a dictionary / encyclopedia) will respectively pay for PT, hospitals and regional rail. Selfish car drivers should be subsidising those who make an effort for the greater good. May I point out that “it” does not take the possessive apostrophe. What if the whole land transport system was self funded? No rates money, no licensing fees, no fuel tax ( change to a carbon tax). I would like to see this modeled. Say we start with the assumption of a road only network then using GPS charge a flat rate per kilometer dependant on vehicle size sufficient to cover maintenance, improvements and health costs as well as even some sort of asset tax. PT then assessed for space saving and more efficient use of network. Then use congestion pricing to fund new projects. Does anyone have a figure for Total cost of the transport system / Total kilometers travelled? It would be interesting to see. You’d have to include the costs resulting from sprawl, including social costs and lack of accessibility for non-drivers, climate change costs, including refugee costs and resource war costs, and the costs resulting from lost biodiversity from the space taken up by roads. We now have the required technology to fully privatise the road network. I’m talking about a total sell off of all assets (including the land underneath) and GPS based user pays for every trip. Just the land alone must be worth a fortune, hundreds of billions? So why not do that David if it isn’t subsidised? It is interesting to note how little the numbers game has changed since 1955 when the Railways Commission reported to the then Minister of Railways, Mr Goosman, on August 27 of that year, that it was unable to recommend that the Morningside deviation, as proposed, be proceeded with. This recommendation was forwarded to the Technical Advisory Committee of the Auckland Regional Planning Authority, the body responsible for the production of the Master Transportation Plan for Metropolitan Auckland – the grand plan that overwhelmingly recommended roads, roads, and more roads as the only solution to Auckland’s growing traffic congestion. Nicely sums up why we are where we are today. Now compare with a typical medium-sized city in continental Europe where spending on good public transport was not skimped on, in favour of roads, roads and more roads. NZ’s biggest businesses are Tourism, IT, Education and Agriculture. In this competitive world we must make our cities better. It was encouraging to hear our new tourism minister say that a new bike/pedestrian path attached to the harbour bridge will be good for tourism. But I think it will be good for our education and IT businesses too! NZ and our cities must be easy places to live and that means low costs of doing business, well educated people, simple government requirements, good PT, friendly environment etc. Silver Fern Farms, Lendlease, Healtheries, and now XERO. Auckland has made great progress but must continually improve and regain number 1 city in the world. Jim – “regain number 1 city in the world” – come on, it never has been, and honestly: never will be. That ship sailed a long time ago. Now that’s a much more achievable, aspirational target. ! Funnily enough tourism also has the worst paying jobs. The tourism industry actually makes this country poorer. Dairy is the only reason we aren’t a third world country (also causes lots of poo-lution). You are right that tourism doesn’t pay well and is not the road to riches, but the idea it makes the country poorer is absurd. If tourism was to disappear overnight we would certainly not be wealthier. Wealth creation, hmmm. For whom? And is there enough in it for the public purse to pay for the long-term problems that these three damaging aspects of the industry cause? I don’t think any industries are being crowded out by tourism at the moment so there is no guarantee it would be replaced by something else more beneficial. If tourism were to disappear overnight the biggest impact would be to the budget deficit, tax revenue would fall dramatically, while welfare payments would have to increase significantly. It’s hard to say what spending would be cut but it wouldn’t be a pretty picture. It’s something NZ needs to prepare for though, it’s unlikely the world will be extracting oil in anything like current volumes in 20-30 years as land transport becomes increasingly electric. This may make it unviable to extract and refine oil simply for jet fuel. Part of me is hopeful that under the current government, we might be able to transition more smoothly to that possibility. Better labour laws and enforcement to ensure people are benefiting from the industry. Better environmental care paid for by the taxes on the industry could mean a resurrection and further increase in DOC jobs and many others. Better decision-making about the type of tourism we want. Then when it’s finally no longer PC to fly for recreation, we’d have a better environment, a more healthy population, and a suite of more local businesses which could switch from supporting international tourists to supporting local tourists. But to achieve this, I think we need to discuss it in these terms. The current industry leaves too much to be desired to think of it as a wealth creator. TBH, I think we will continue to fly just as we do now. Humans have proven to be very innovative and generally not keen on stepping backwards. I suspect we will end up with an alternative fuel source that is either carbon free or has a short carbon cycle and doesn’t involve extracting fuels created thousands or millions of years ago. Yes crap article by David Chaston, probably like those people that see a suburban bus at mid morning with 3 people in it and so think they are a waste of public money due to their tiny little perspective on things. Matt L there is something very, very wrong with your numbers. If an average bus ride cost $2 and an average train ride $2.50 our transport system would be making massive profits. You can hardly ride from one stop to the next for under $2. The truth is our PT system runs at around 47% fare recovery and massive subsidies are required to keep the PT system operating. It’s ironic that an article criticising another writers numbers relies on fantasy numbers in response. The losers here are the public who don’t have the knowledge to disseminate such information. I think you might have forgotten about children and students when you did your back of an envelope calculation, not all fares are adult fares. It’s ironic that a comment criticising someone else’s numbers has made such a basic error. Not to mention SuperGold fares, transfers, and monthly passes. sounds like a job for Greater Auckland contributors. Using things like traffic volumes, induced demand estimates etc. Waterview will never pay for itself. The revenue is zero and the operating costs are huge. The tunnel will lose tens of millions of dollars every year for as long as it operates. it indirectly earns revenue in fuel tax, but they’d be pretty minimal compared to operating cost etc.